Right before a movie starts at a theater, you are advised to avoid being a jerk by turning off your mobile phone. If you chose to ignore that, imagine if the screen’s flickering lights or music within the movie could trigger your Android to call all the other “infected” Android smartphones in the theater, shortly before they all start shrieking with a loud siren sound. 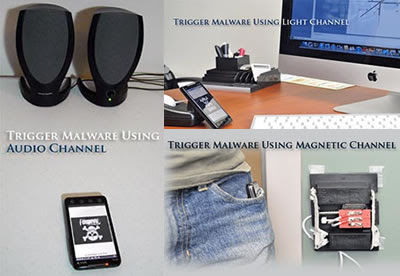 That was dubbed an “annoyance attack” by security researchers at the University of Alabama at Birmingham (UAB) who developed nearly impossible-to-detect sensory methods that can trigger embedded malware in mobile phones. We’ve all heard of subliminal messages hidden in advertisements, but most of us have not thought about “subliminal” messages to trigger malware that was dormant until it is set off by sounds from a TV, radio, music, P2P TV, or even musical greeting cards. Besides successfully using audio as a mode of transport, the researchers also used light, magnets and vibration as other trippy malware triggers. Security research into sensory malware is few and far between, but previous work used an Android Soundminer app that listened to phone calls and stole credit card numbers either spoken or entered onto the keypad. Another used a smartphone’s accelerometer to turn an iPhone into a spiPhone to eavesdrop and track what you type on a nearby keyboard. Other researchers created an Android PlaceRaider app for visual malware that secretly snaps a picture every two seconds. Now the UAB researchers proved the feasibility of using sensing-enabled covert channels. The team found that using the light channel works best at night or in a dimly lit place, but could work from the lighting of a large screen TV, computer monitor or overhead lights. Attackers could use magnets attached to NFC readers to tap into a mobile phone’s magnetic sensors and activate embedded malware. The researchers discovered that “command and control trigger messages” in music could be sent over 55 feet indoors and 45 feet outdoors.